I don't know about you, but my favorite part of Halloween is the day after -- November 1. Not only do you have a bucket full of candy, it's Dia de los Muertos. The day of the dead. A celebration of those who have past. It is equal parts colorful and creepy, and I for one can't get enough of it! 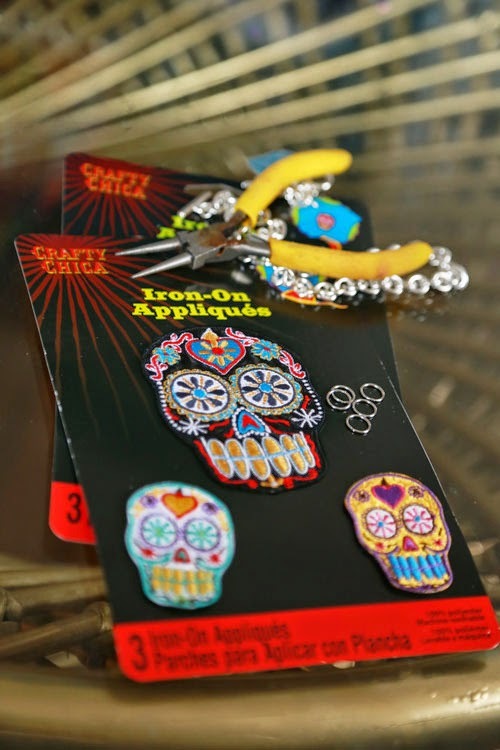 Thanks to I Love to Create's new Crafty Chica line of Dia de los Muertos goodies, we can all join in the fun! 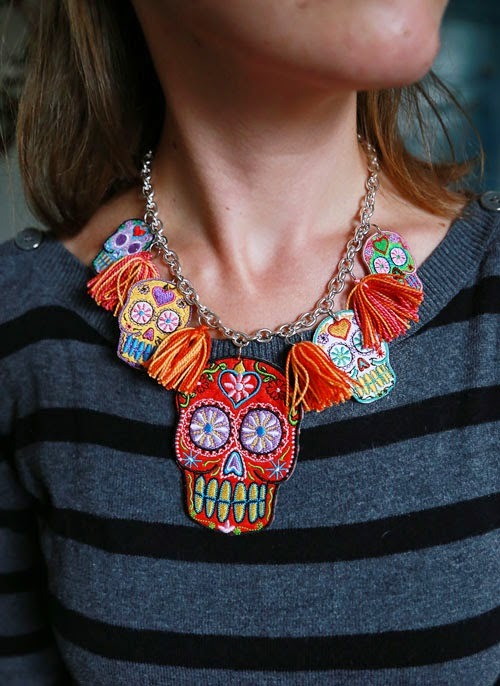 This necklace is easy to make, inexpensive, and can be worn all autumn long. It's the festive touch your outfit needs! Use your pliers to open an O ring and push it through the top of the patch. You may find it easier to create a starter hole using a safety pin, but it's not necessary. Attach each O ring to the chain, starting at the center and work your way outward, larger skulls going toward the center. If you want to include some fun tassel accents, be sure to budget enough space for them as well. 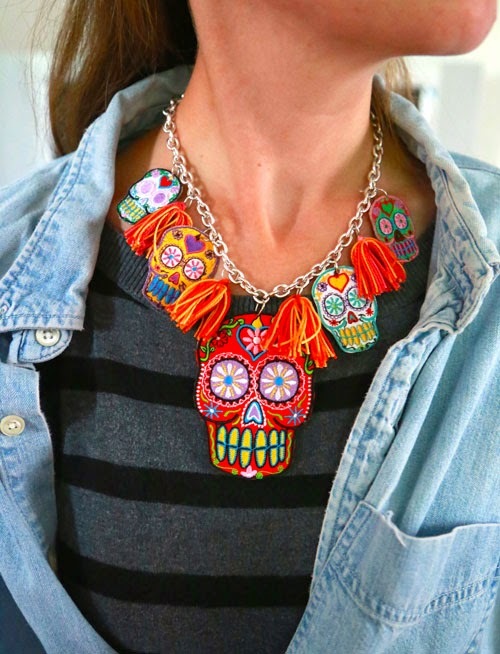 Dia de los Muertos is an eclectic holiday that pulls inspiration from many elements, so feel free to add other things to the chain, not unlike a charm bracelet. What about beads? Or that single earring sitting in the bottom of your drawer? Build it up. It's going to look awesome! That's it. Look at you! Time to party! How much FUN is this one! Do they curl up after you wear them a few times? 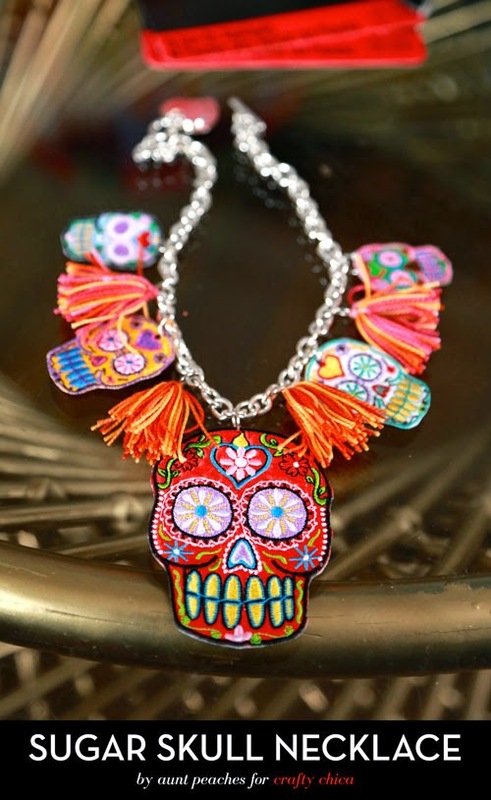 Great, these jewellery are looking so good and skulls are so good things to design a attractive jewellery.